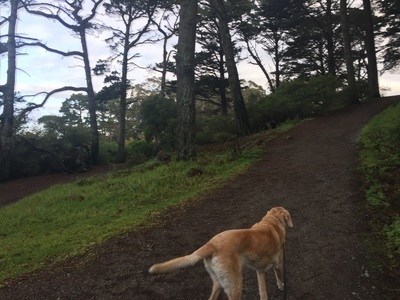 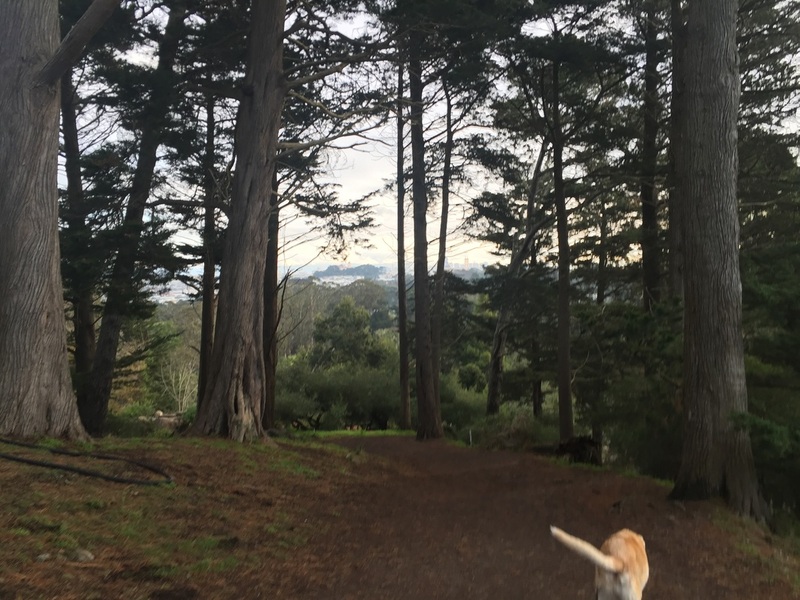 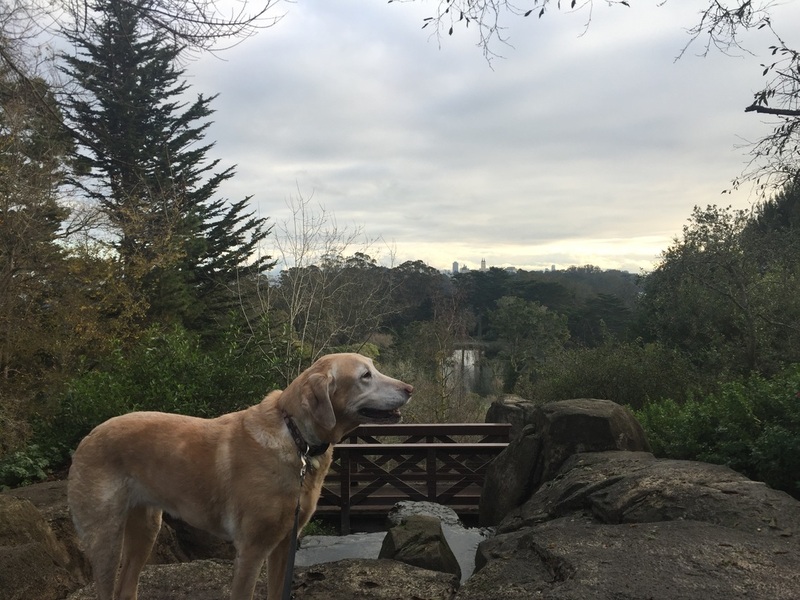 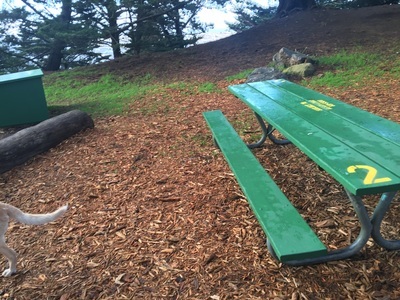 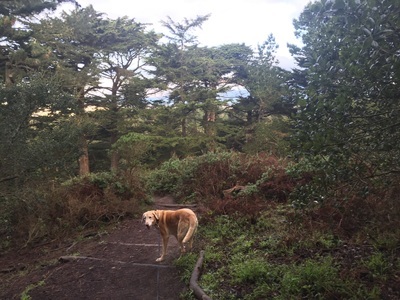 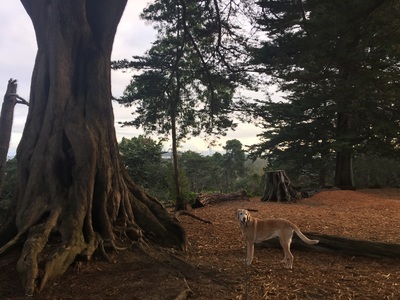 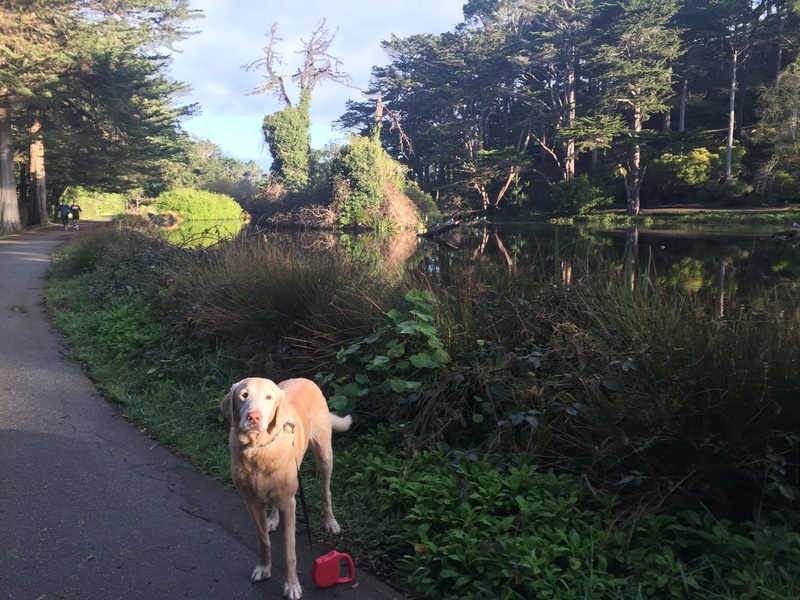 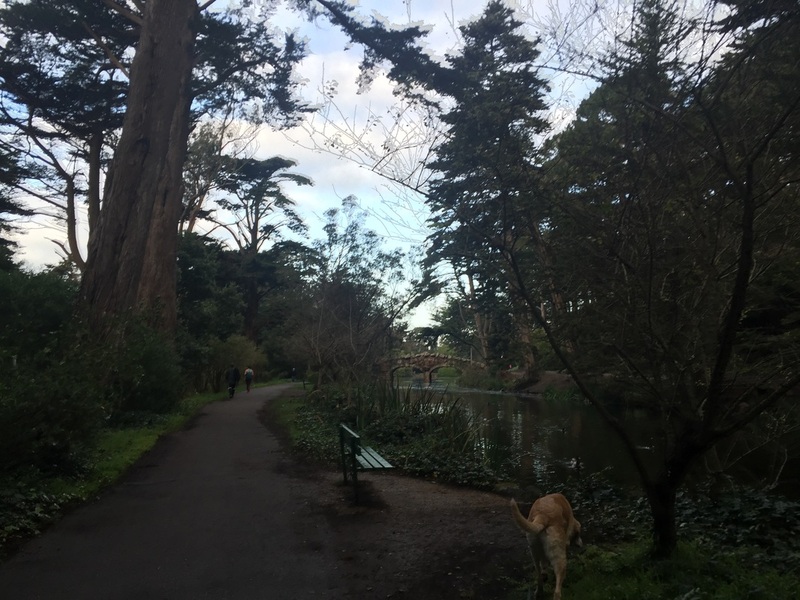 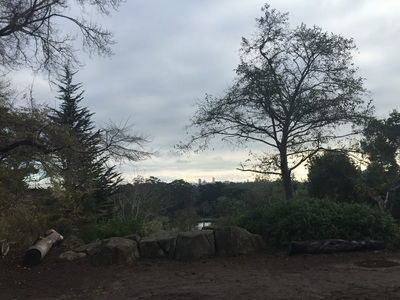 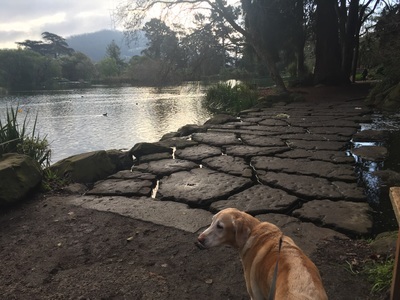 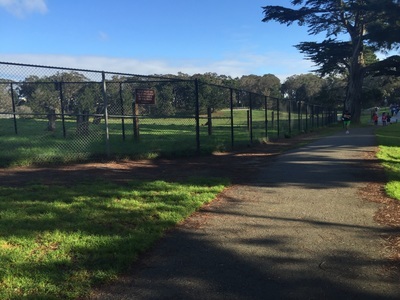 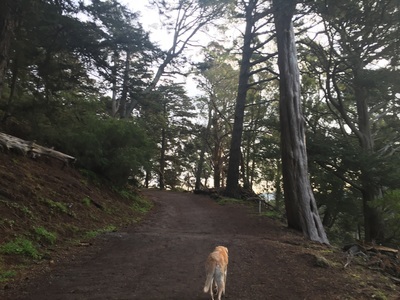 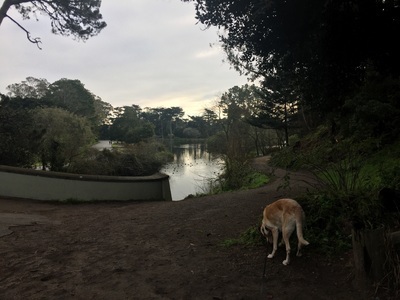 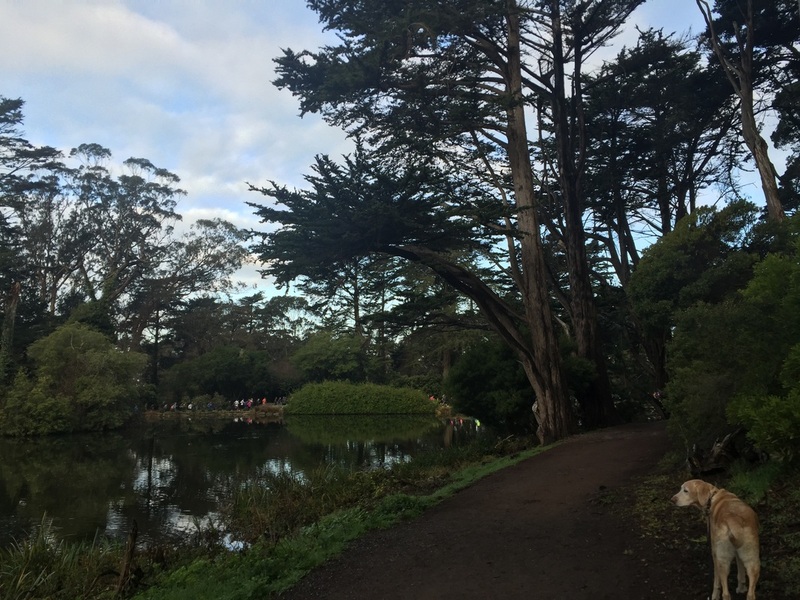 Description: Golden Gate Park is a beautiful spot that's actually larger than NY's Central Park at 1,017 acres, 3 miles long and 1/2 a mile wide. 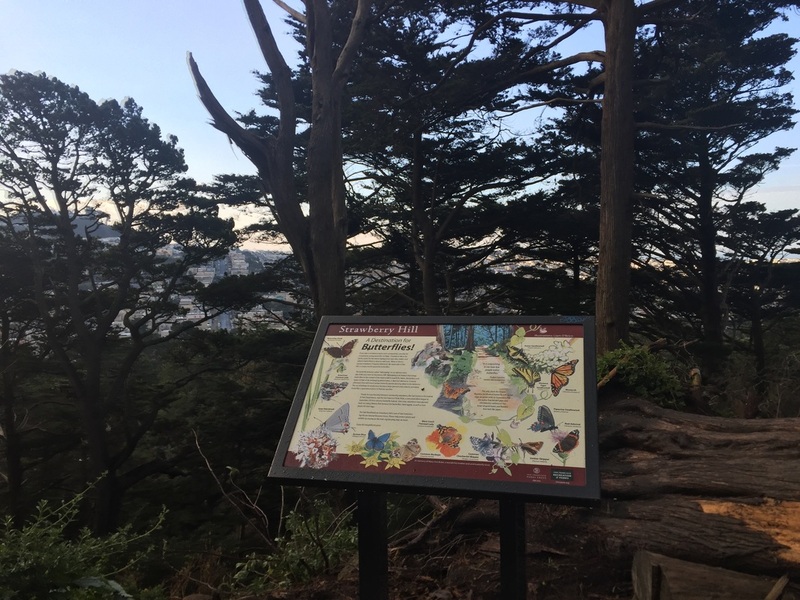 It's so large and has so much to see that it will probably take you a few visits to explore it all. 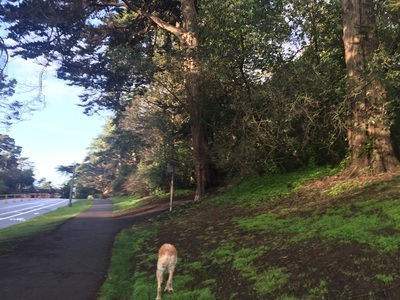 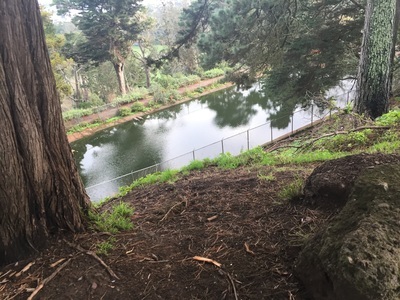 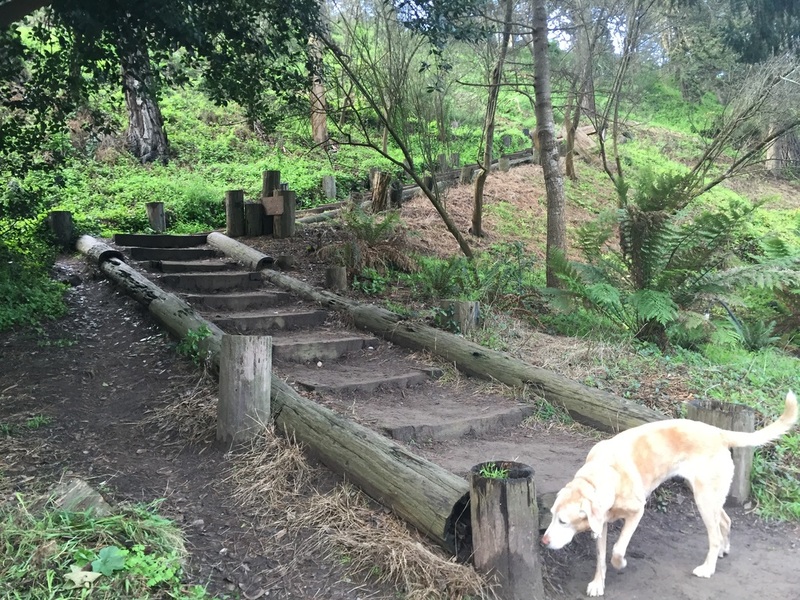 The only real hike in this park is Strawberry Hill, the 412ft hill in the middle of Stow Lake, which has created a beautiful moat around it. Dogs used to be allowed in boats on Stow Lake, but unfortunately I heard that recently they are no longer allowed. 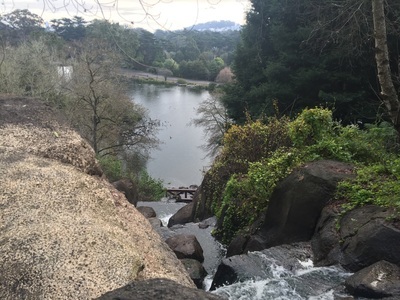 However, it’s still a beautiful place to visit and you can grab a snack at the boathouse (open Mon-Thurs: 11A.M.-5 P.M., Fri-Sun: 11 A.M. to 6 P.M.). 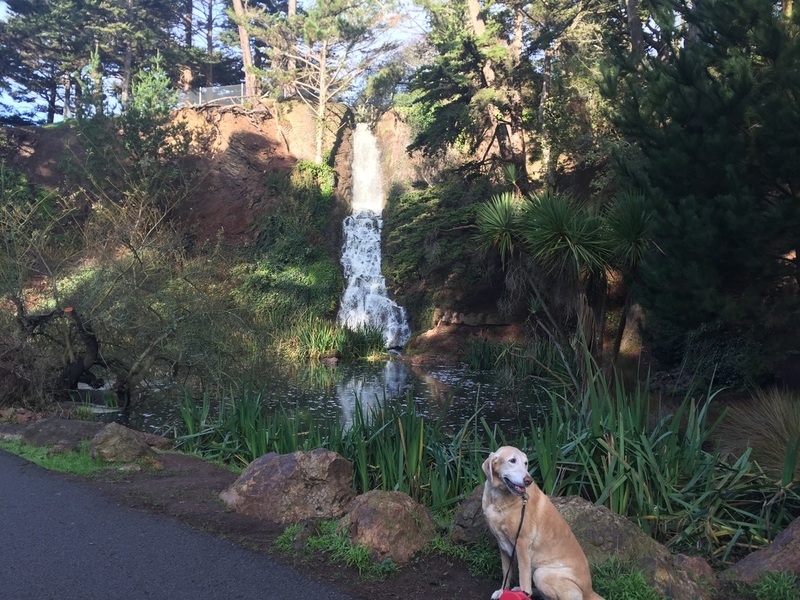 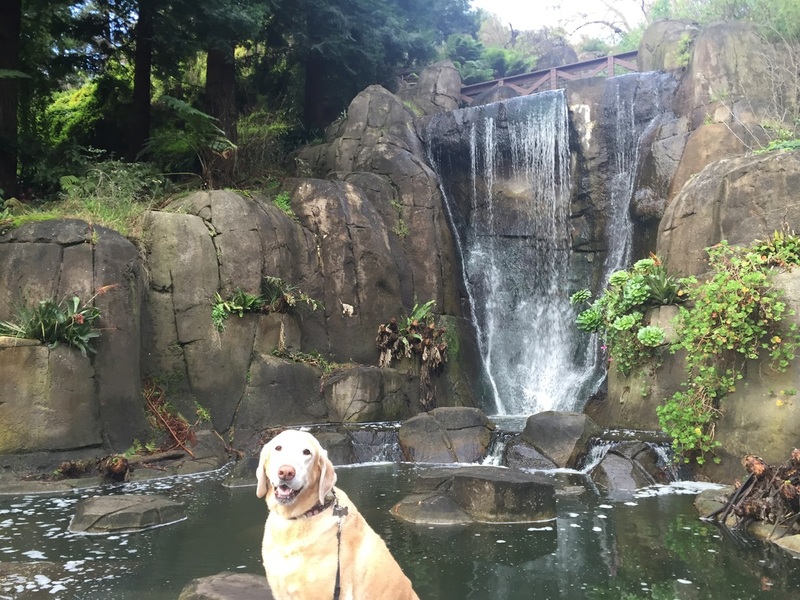 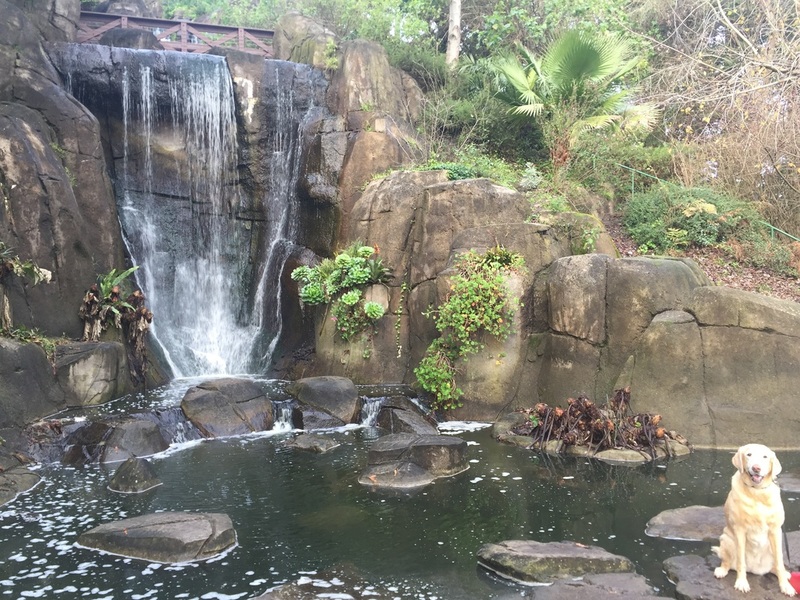 You can walk around Stow Lake on the pedestrian path, visit the Japanese Tea Garden and view the 110 ft Huntington Falls, which empties into it. You can hike up to the top of Huntington Falls, at nearly the top of Strawberry Hill. 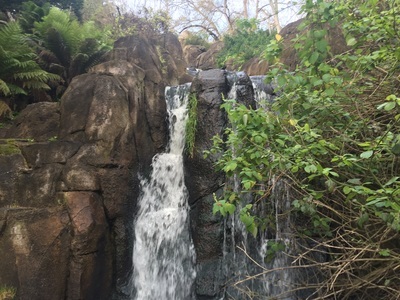 There are also 2 bridges partially up Huntington Falls that you can take to view the waterfall from another angle. 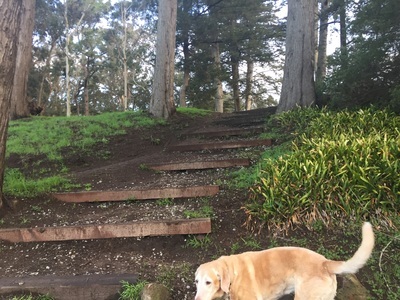 Strawberry Hill has a hiking path which circles around and snake up to the top. 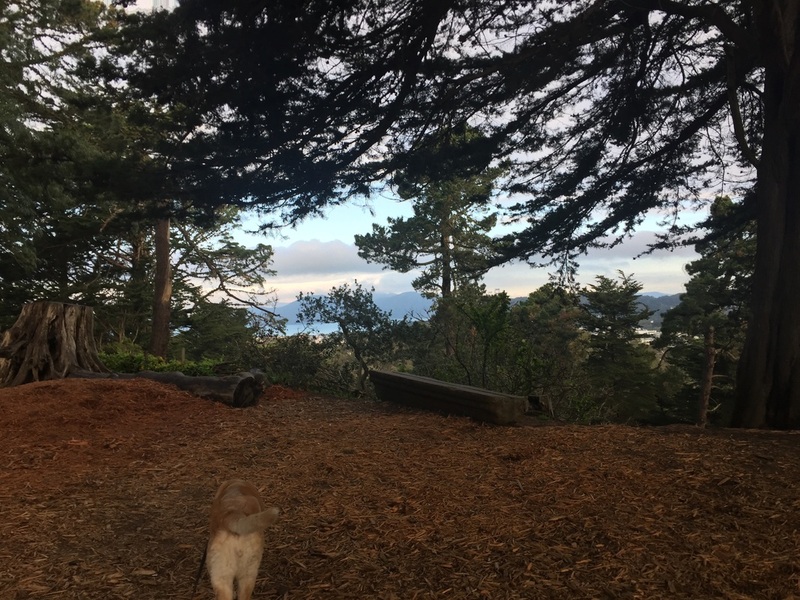 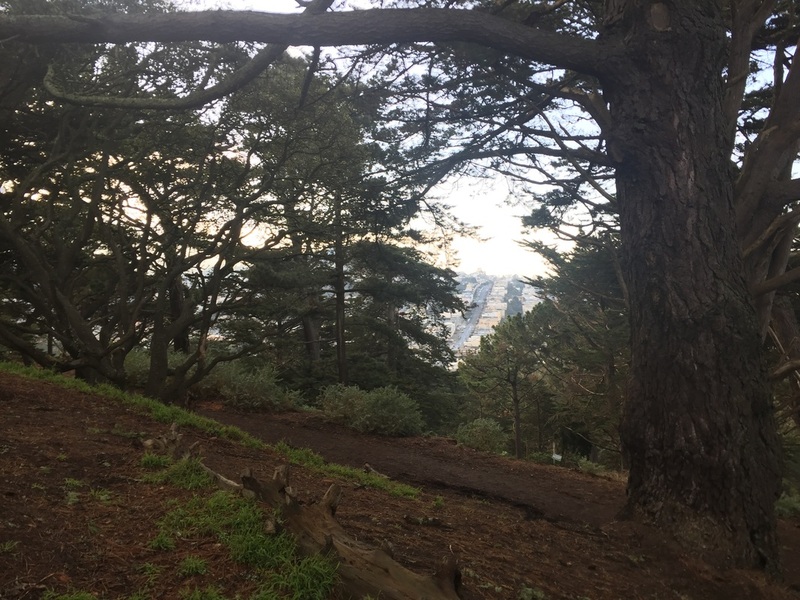 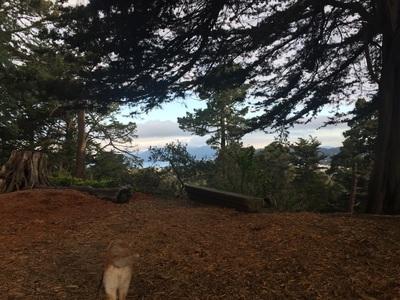 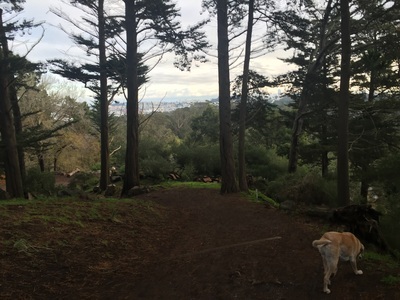 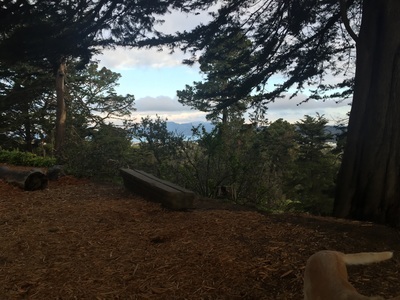 There are partial views of the bay, and you can even see a glimpse of the Golden Gate Bridge, but the view is obstructed by some trees. 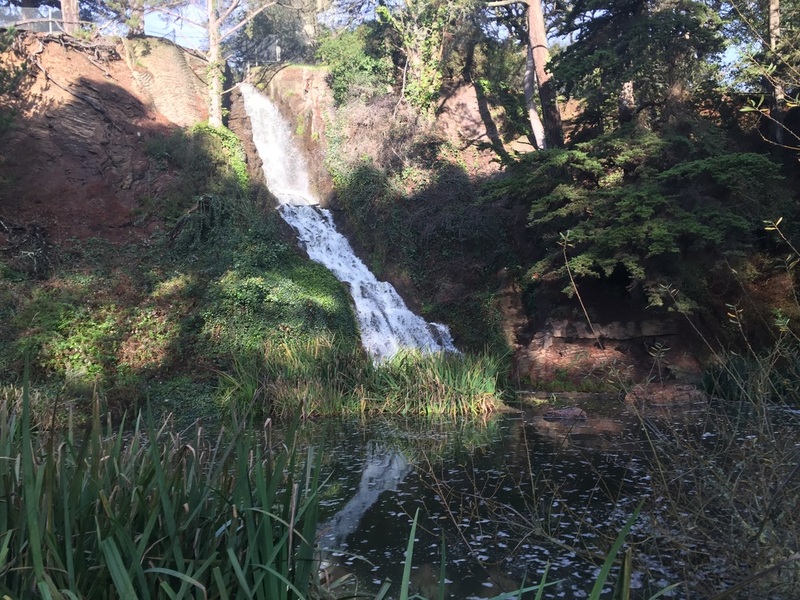 After visiting Strawberry Hill you can head south to the 60 ft waterfall Rainbow Falls (#58 on the map). From here you can visit the Bison pen (#82 on the map, off of Chain of Lakes Drive East & John F. Kennedy Drive). 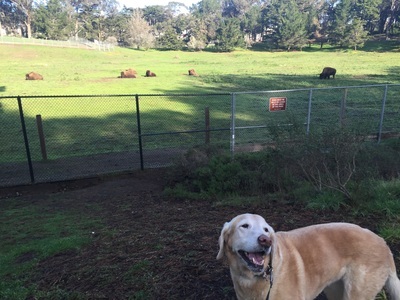 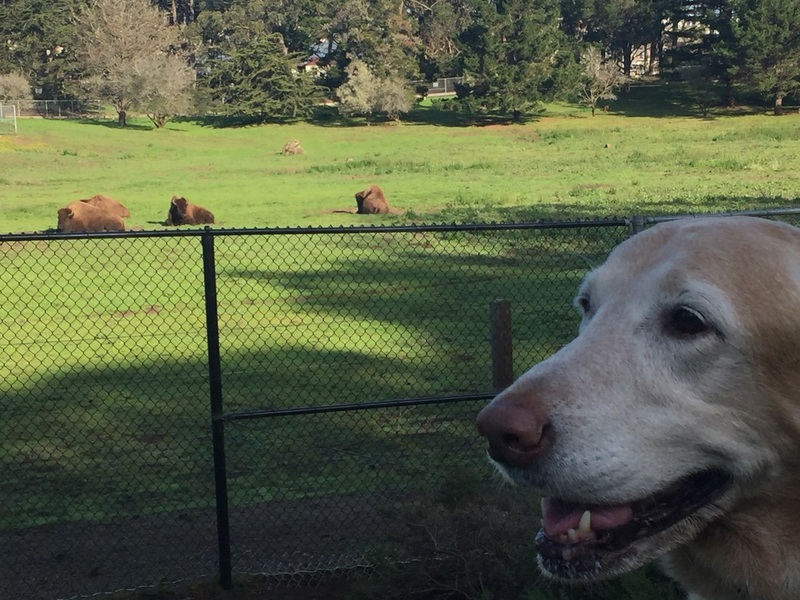 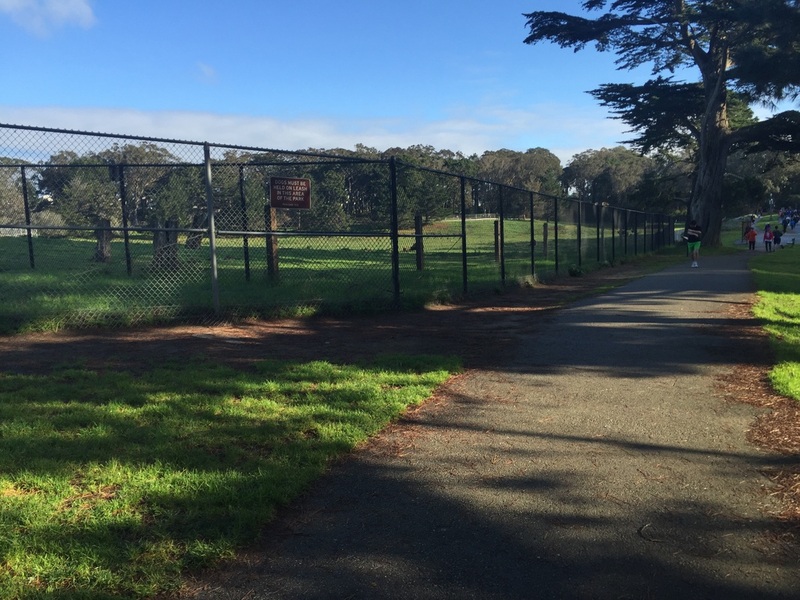 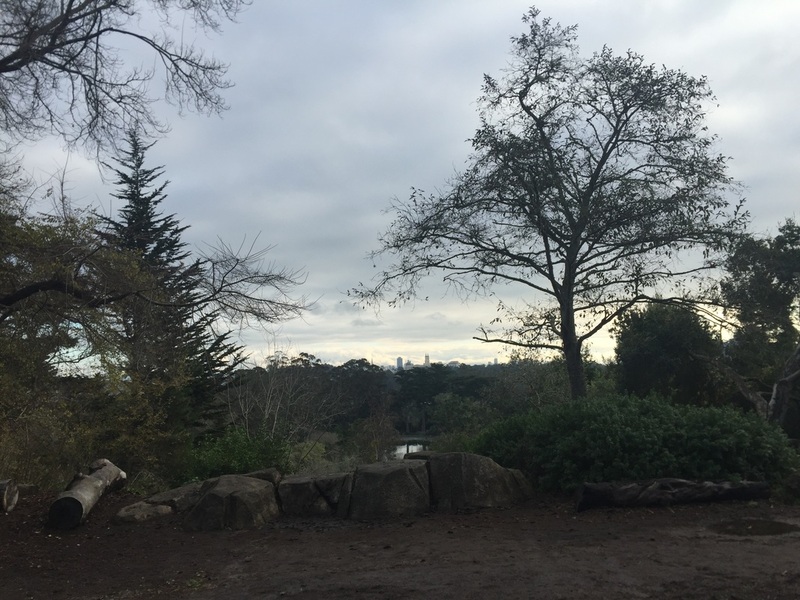 Did you know that there are American Bison in Golden Gate Park? 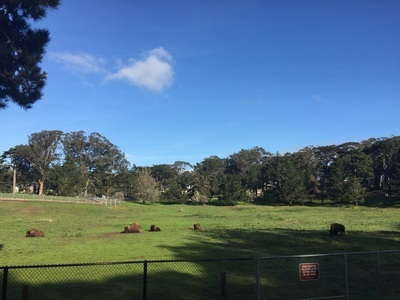 Golden Gate Park used to be home to elk, deer, bear, sheep and bison in the 1930s. 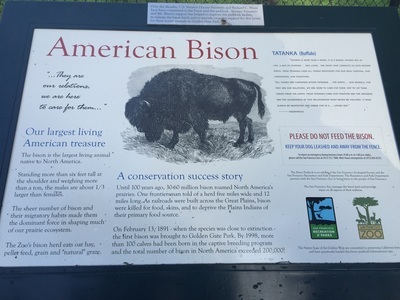 There is a small herd left of these gigantic 1-ton, 6ft tall creatures. It’s definitely worth a stop on your walk! 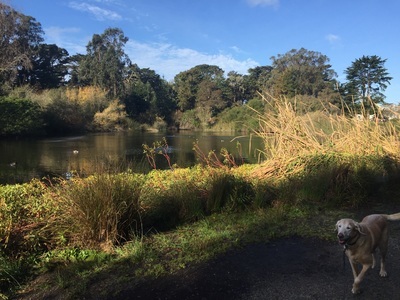 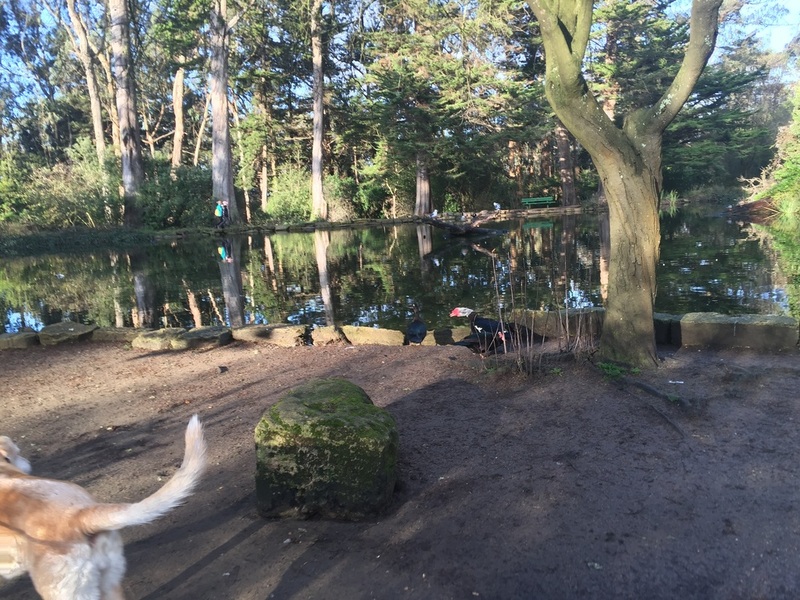 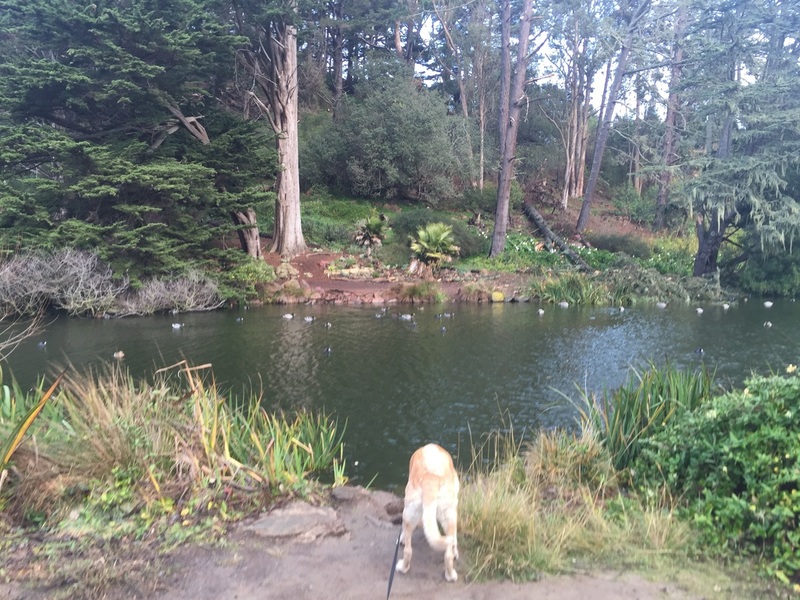 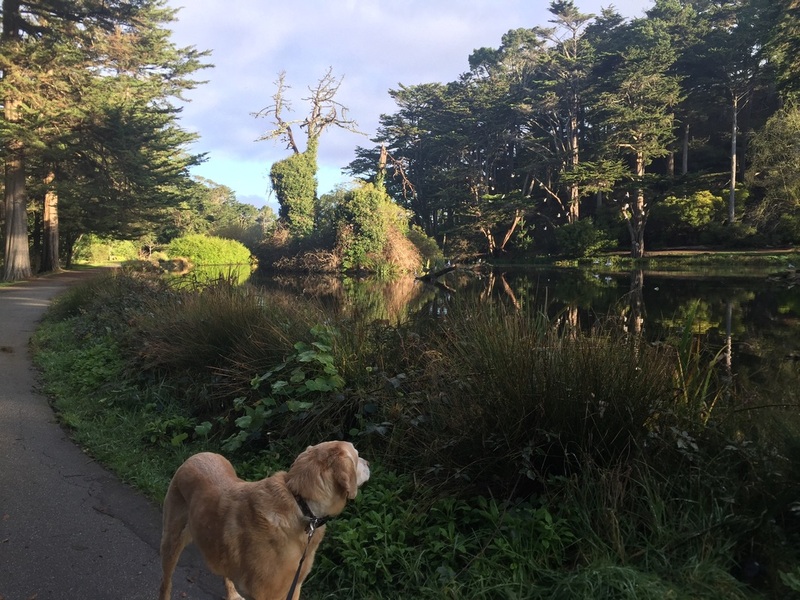 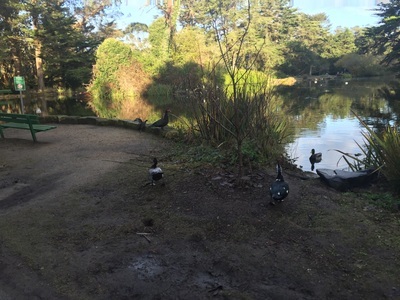 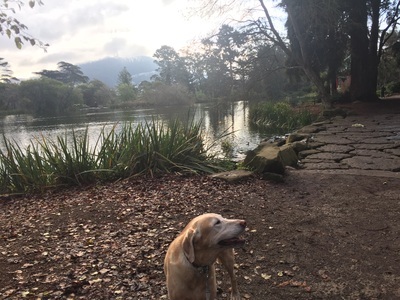 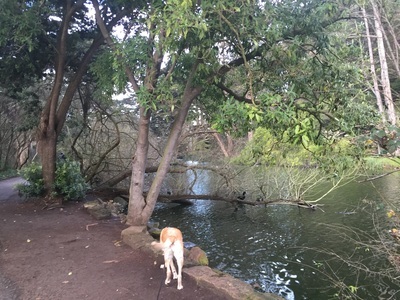 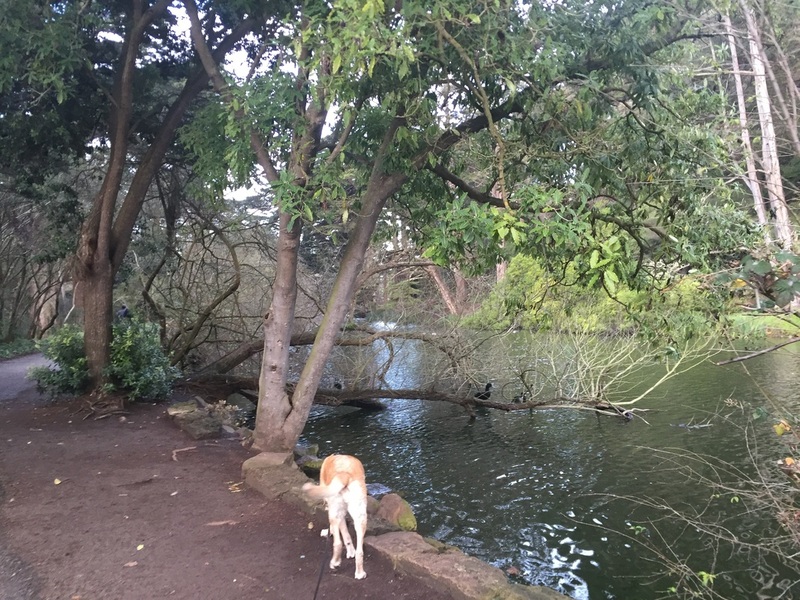 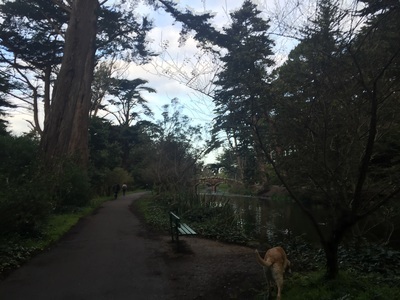 There are several other lakes and ponds throughout Golden Gate Park. 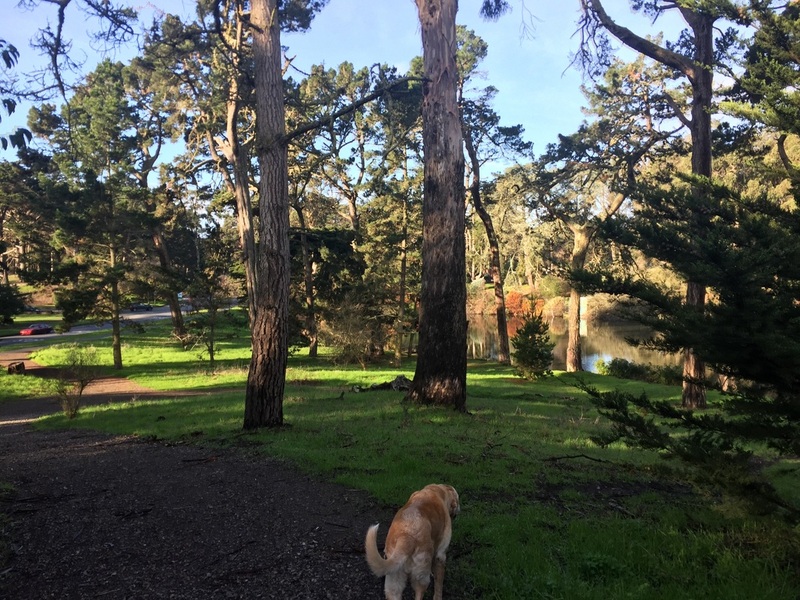 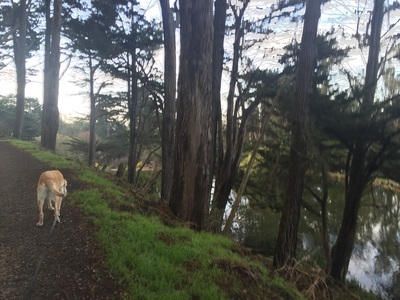 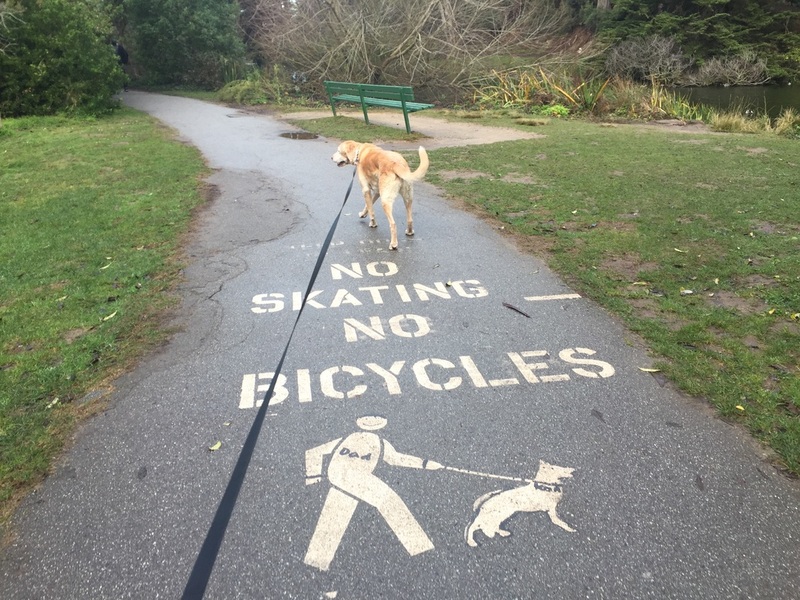 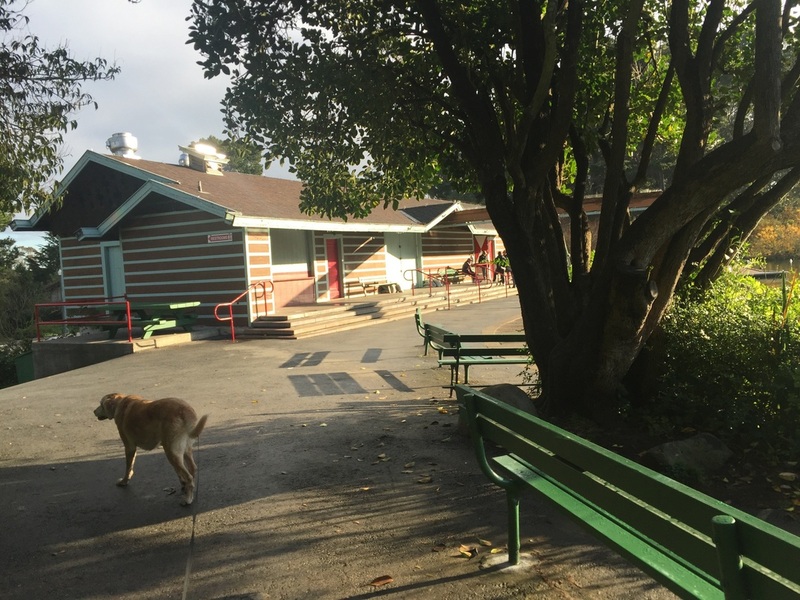 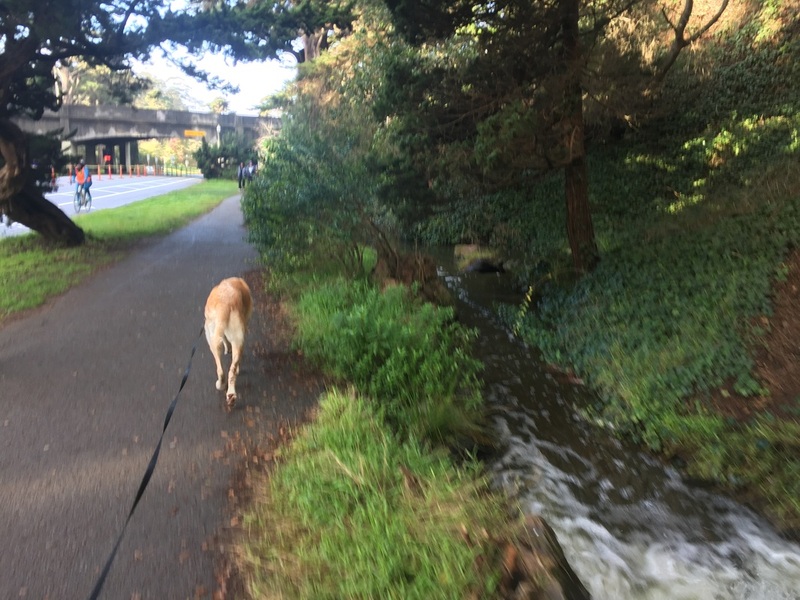 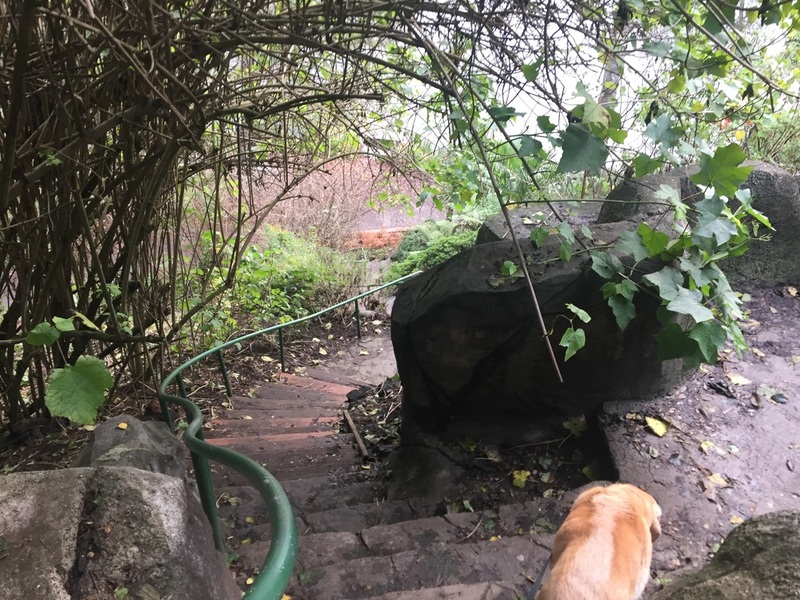 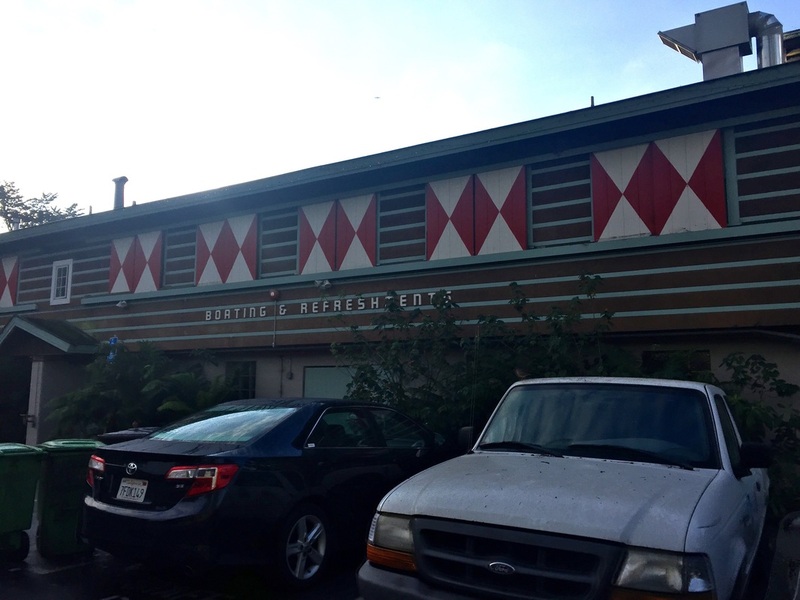 There are also 3 off-leash dog runs, throughout the park: on the southeast side bordered by Lincoln Way/Martin Luther King Jr. Dr./5th Ave/ 7th Ave; on the northeast off of Stanyan St. between Hayes St. and Fulton St.; and on the western side bordered by Martin Luther King Jr. Dr./Middle Dr./34th Ave/38th Ave. 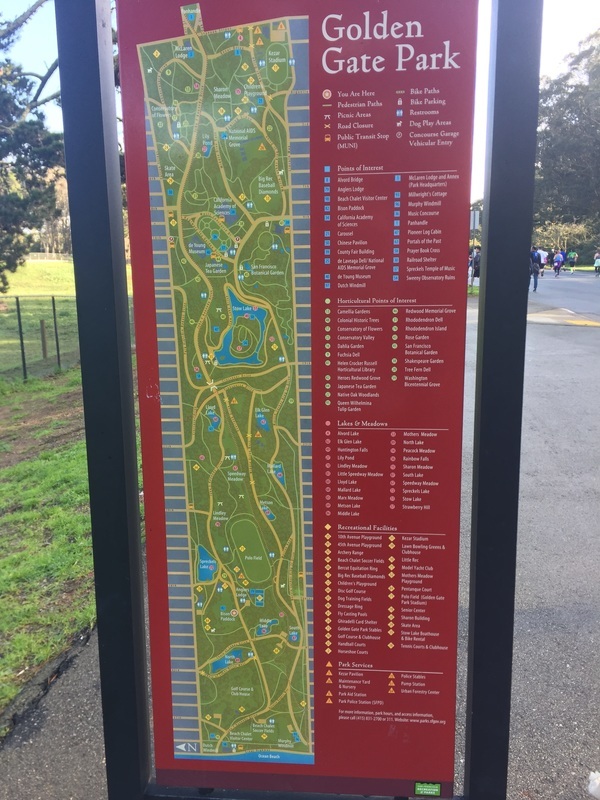 There is a restroom available in the boathouse, as well as others on the map below. 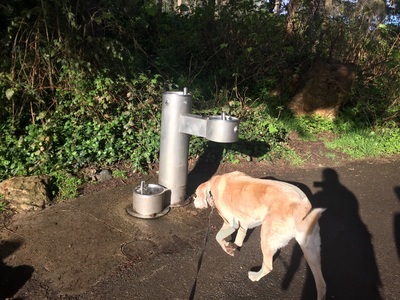 Dog water fountains and trash cans can be found throughout the park.